Do you believe in ghosts? I have had some ghostly experiences I cannot explain but a believer? I don't know. 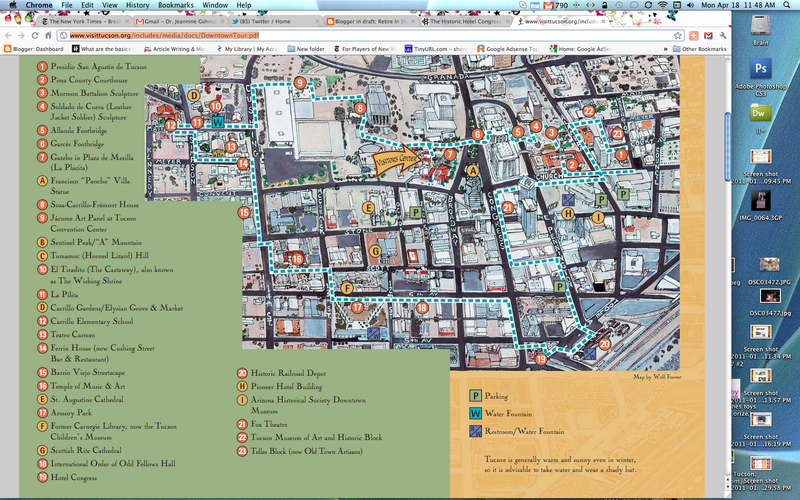 However, there are places that seem to be perfect for ghosts and the Old Pueblo (Tucson AZ) is one of them. I suppose that is why we like to wander down to the Congress Hotel in the city center. Some very famous bad guys have met their demise there. Last Saturday we had breakfast on the shaded patio of the Little Cup Restaurant located in the hotel. It was very crowded all the time we were there. This little restaurant has been featured on Racheal Ray's $40 a day tv show. I thought it was lots of fun and the food tasted very good to me. The Congress is located just across the street from the old Southern Pacific train station built in 1909 and very near to the historical site when Wyatt Earp and Doc Holiday killed Frank Stilwell in 1882. Earp and his followers were exacting revenge for the Tombstone "OK Corral" shoot out. To top it off the famous bank robber John Dillinger was captured in the hotel in 1934. Don't tell me ghosts aren't walking those streets on a hot summer night! Adding to the experience of visiting the hotel is the fact that the current owners have not changed the decor any more than necessary to make it usable, so the old hotel remains pretty much like it was when it was originally build in 1919. The southwest designs on the walls and decorated doors are very true to the originals. I was allowed to venture up to the second floor where the staff let me look at the rooms. Each bedroom sports it's own bathroom tiled from top to bottom. The furniture looks like it could have been original right down to the bedspreads on the beds. I could not help but wonder about all the people that had climbed off the train and walked across the street to spend the night. The SP Station (Amtrack Station) has been restored by the city of Tucson. It houses Maynard's Market and Kitchen, the Amtrack waiting room and a museum of transportation history. If you are a train buff, you will love the steam engine they have standing in the back near the railroad tracks. This shiny beauty is lovingly cared for by volunteers. Maynards Kitchen, described in the New York Times as “dark and handsome”, and voted “Best Romantic Setting” by Tucson Weekly, will consistently delight you with wonderful food & wine, its hip, spirited bar, and evocative, elegant atmosphere. 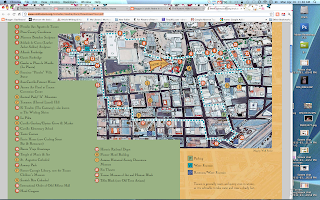 Walking Map of Downtown Tucson. Drive on down to the hotel located on the corner of Congress and Broadway in downtown Tucson. Maybe stay at the Congress just to see what a very old hotel feels like. The room rates range between $89 and $119. Listen for Ghosts at night. Walk across Congress Street to the Unions Pacific Station to see the bronze of Wyatt Earp and buy a beautiful bottle of wine at Maynard's Market. Check out the happy hour in the restaurant. If you stay more than one night, walk on over to El Charros for dinner (featured in Gourmet Magazine in October of 2008). It is located on Court Street in the Presidio a few blocks away. El Charro's was established in 1922...maybe Dillingers ate his last meal as a free man there. It is still run by the family that built it all those years ago and it's claim to fame is that is it the nations oldest Mexican Restaurant run by the same family still in operation. Legend has it that the chimichanga we all eat in our neighborhood Mexican restaurant was invented here. You will get to try some authentic Sonoran Mexican food in a beautiful setting. The patio is quiet, charming and protected. Be sure to check out the bario just south of the downtown and go north to the Presidio. Take your camera. You will not regret it. Tucson is called the Old Pueblo for a reason. You will go home with a better understanding of this historic place. And who knows. Maybe you will even have a story or two. There are ghosts wandering those streets. This is the kind of experience a vacations or Sunday outing is for.